The IEEE Task Force on Process Mining has just released the Process Mining Manifesto. This the single best, most concise description of what process mining is, and what this revolutionary new technology might bring about. Process mining is the scanning historical records of activity in order to determine the process that had been used. A process is simply a sequence of actions. Process mining uses recorded evidence of many such sequences to give you a picture of the typical path and exceptional paths as well. Research on this field started in the mid 1990’s. This means it is still a relatively young field, it has come surprisingly far in a decade and a half, and can be used successfully in business situations today. Fujitsu launched process mining as a service offering three years ago, called Interstage Automated Process Discovery. I have been involved in the launch and evangelism of this new approach for understanding and optimizing business. See this 9 minute demo and this podcast on Integration Developer News. My most recent webinar last month to ASQ was on how process mining can be used to support Lean and Six Sigma methodologies. I have personal experience with using the approach, and the results are dramatic. A simple, two week consulting engagement can give a medium to large organization a number of tips that will certainly save that organization millions of dollars. It is not unusual for people who hear about the approach without experiencing it, to believe that it is too good to be true. They have a hard time believing that it really works, and it is pretty amazing. Other members of the IEEE Task Force have run into the same thing: there is not enough known about process mining, and it seems too good to be believed. This drove the need for a Process Mining Manifesto to clearly define process mining and to help people understand the real promise of this new technology. It was written largely by Wil van der Aalst and his colleagues at the Technical University of Eindhoven, but also with representation from a broad range of contributors across industry and academia. It is now being translated into a dozen languages. Process mining is especially important to Adaptive Case Management (ACM). When it is impossible to predict the process ahead of time, knowledge workers need to move forward without a predefined process. Process mining promises a way to retrospectively see what the pattern of work turned out to be, even though it was planned as the work was being one. Process mining can give you metrics about the process which can be used to evaluate how well the work is being done. Even though the process is not automated, you can get many of the benefits normally associated with BPM. It may be possible to avoid completely the large expense of designing the process up front. This would allow social business software to be used for planning and managing work directly, and still have the insight to improve the business processes over time. See my next post about “Flipping the Process Life Cycle” to see how process mining might be incorporated into everyday management of knowledge workers. 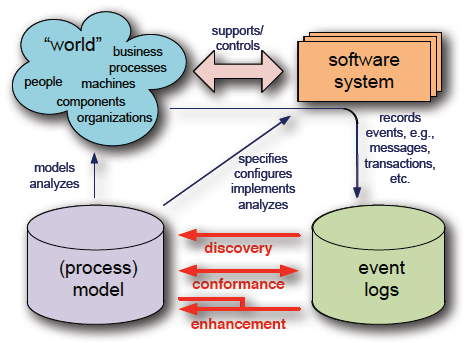 This entry was posted in Process Mining, Social Business, Workflow and tagged ieee, process discovery, process mining. Bookmark the permalink. – identify people who others rely on, if they heavily on each other or if there are bottlenecks regarding to much inbound to low outbound, if resources are balanced to collaborate and if escalation occurs naturally among people when peak / unpredictable events happens. – how people share information. – If there is articulation or communication infra-structure does not enable information and knowledge flow. Does it work for most of the execution scenarios or is necessary to fine tune and adapt. – Does the organization respond, in other words, there is awareness when an event occurs and the people reacts and start working on something or is there a lag? – Who perform best? What are the right teams to assemble regarding past experience? Pingback: A Real-World Assessment of the Process Mining Manifesto « Welcome to the Real (IT) World!